Urban Turnip is a simple grow-your-own resource that brings time-tested wisdom, alongside a modern understanding of plants, to the city setting. The focus is on growing in containers, though there’s also resources dedicated to small space, hydroponic and indoor gardening too. It’s mostly inspired by my own growing successes (and many failures) in London. 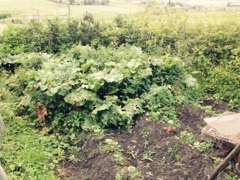 My old rhubarb patch in need of weeding! Whether you’ve got a few harvests under your belt already or are just toying with the idea of starting a windowsill herb garden, I sincerely hope you will find something of value here. Please get in touch and let me know what you think of the site if you get a chance. I’m always open to suggestions and feedback. 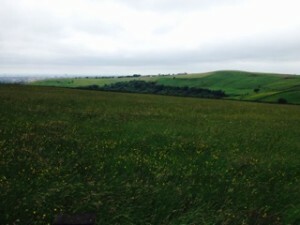 I grew in the countryside just north of Manchester. My grandfather was (and still is) a cattle farmer who had a penchant for growing his own food. 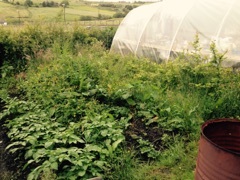 Looking back, I can remember unruly vegetable patches and poly-tunnels filled with as much junk as tomatoes, rather than a neatly ordered growing space. Nonetheless, anybody who can coax apple trees to a prodigious harvest in the upland South Pennines is worthy of respect in my book! 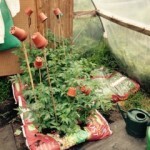 Tomatoes…the upturned pots are to prevent poked-out eyes. I moved to London to study at university and fell in love with the city. I was drawn to gardening, and particularly edible gardening, after growing increasingly frustrated at the dependence I felt, both physically and intellectually (I realised that I actually had no idea about where my food came from) on giant, faceless supermarket brands. So, to cut a long story short, I started growing – making use of every available bit of space that I could – and haven’t looked back! I’ve written about some of my favourite gardening books and tools here. Oh and don’t forget about the mailing list! Just drop me an email at: dan [at] urbanturnip [dot] org. I’d love to hear from you! Thanks for the potting soil/mix reviews. I have been a long term user of Miracle Gro potting soil and have had good luck with my indoor plants for about 30 years. My problem is the last 3 bags I purchased (including a bag I purchased 2 weeks ago). The soil is completely completely dry….no moisture. I noticed I have had to water more frequently with this dry soil and do not wish to continue to do so. I contacted the company and was told the bag can contain either dry or moist soil but either way it should not affect the quality of the dirt/plants growing, etc. What is your opinion? Do you know if the organic Miracle Gro and the Canna brand soil tend to be on the dry side? I think I may look into one of these brands. Thank you for responding. Great to hear your story. It could just be that the ingredients of potting media are the same but they hadn’t been moistened before hand…so you could get a peat or coir-based mix either wet or dry but the water-holding capacity would be exactly the same after you’ve wet them. The easiest solution would be to do your own mix…you know exactly what you’re getting then. I am Orchids grower. I grow tropical orchids but I don’t have much knowledge about orchids fertiliser (food) am a bit confused because people are suggesting me different names. So, I am looking for help which fertiliser is best for the Orchids, Willing to buy fertiliser for my Orchids. Thank you..
Hey Ato, To be completely honest with you I wouldn’t worry too much about different brands. In my experience they all use similar formulas. I’m writing to you as a means of promoting my invention the “Garden HotZot”. It’s an organic, weed sprayer that kills weeds with hot water. If you have the time and inclination, I’d appreciate any feedback you may have. Looks good Michael, thanks for the mention!